Nothing is ever cool enough for her. 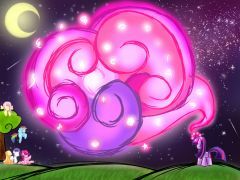 In this episode, Pinkie Pie thinks she sees Rainbow Dash throw one of her pies away and suspects that Rainbow secretly hates her pies, so she attempts to catch Rainbow in her web of lies. The episode aired Saturday 11:30 AM EST on October 14th!! This thread is dedicated to discussing the episode before, during, and afterwards. As the thread is now open it may indeed contain spoilers. I ask that potential spoilers talked about or shown before the episode airs stay within the spoiler tags please, after the episode you no longer have to use the spoiler tags, but warning, if you haven't seen the episode yet after it airs, this thread no doubt will have all sorts of spoilers in reviews, images, etc. So tread at your own risk! I'm super proud of this, I really hope everyone likes her. 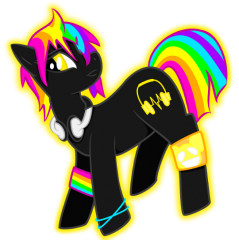 This is my favorite pony artwork I've done so far. 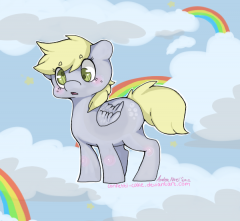 I love little Derpy hooves! 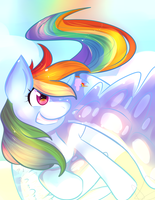 So a while back i wrote a story about how i thought rainbow dash had grown up! Its a little dark but i like it. [colour=#444444]When Dash is stuck in her house during a storm, one of her oldest possession draws her attention, a photo book. A glance through the book leads her down a trip through memory lane. 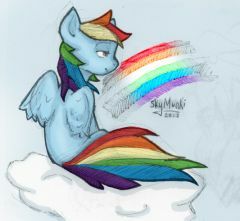 [/colour] Heres the link: http://www.fimfiction.net/story/825/origins-rainbow-dash Tell me what you think! Planning on submitting this to EQD some day. Who Gives The Rainbow Its Colours? Holy WOW this one took a long time. Totally worth it though. 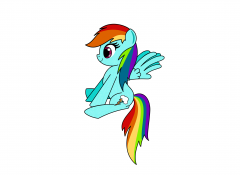 First try at a pegasus. wings took a bit to get right. Now. Just need to figure out how to put a bunch of colors into the mane. 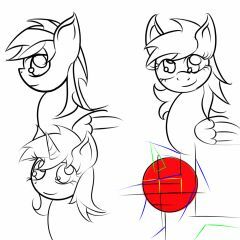 Help me make a pony alphabet! Okay, thing is, I work at a company where I frequently need to read off examples of letters, i.e. 'D for Dog' or 'P for Pony' I REAALLY want to have a pony reference for each letter. HALP me think of some, so I can do my job better! 'G for George' is boring! I wanna do G for Griffon! A-Apple! 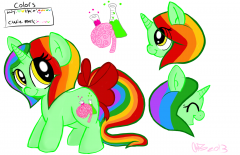 Apples, appley apples* B-Bubbles, as in Derpy's cutie mark, Buffalo, Butterfly, Bon Bon C-Cat, as in Opal, colt, corral D-dog, as in Winona, Diamond E-Equine, Earth* F-filly, foal, friendship, finish, fancy G-Griffon, Gallop, golden, grand, gala, generosity H-Horse* I-?? * J-Jack (as in Applejack! 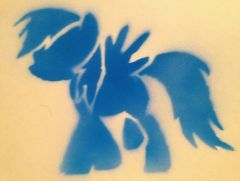 ), jump, jocky, Junebug K -kindness* L -Luna, Lunar, laughter, loyalty M - Magic, Macintosh/Mac* N-Neigh* O - Octave (as in Ocatvia), Opal* P -Pony (obviously), pegasus* Q - Quill, quarter* R- Rare (as in Rarity reference), or Rainbow* S- Spike* T-Tank, tortoise, turtle, tail, train U-Unicorn* V-Voodoo, valley, victory W-winter, whinny, wicker* X- ??? * Y- yay* Z- Zebra* I can has halp nao plz? EDIT: Starred letters are ones I'd like more words for, though if you think of words for un-starred letters, feel free to include them! EDIT: Again, I must reiterate, keep this PROFESSIONAL, this is my JOB. I cannot say things like 'YOUR FACE' to customers, or long phrases like 'I love you.' :3 I'm trying to liven up my work environment, and I'm countin' on you guys to be CREATIVE! Which of mane six do you think appeals most to the target audience? Okay, please do NOT vote for YOUR favorite pony before reading!! Okay, the target audience of My Little Pony is little girls ages 4-12 or so. 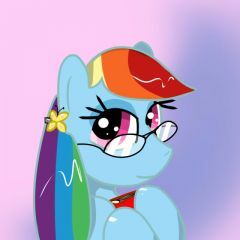 SOO, question 1: Which pony do you think is most appealing to that age group? For example, for a 6 year old girl to watch this show on the hub, which pony do you think would be most appealing to the youth of today? 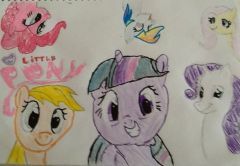 Question 2: Which pony of all of these do you think a little girl would pick out at Target on the shelf, if based on only appearance on the box? Even if you are not an avid collector, everypony on this site knows what the mane six look like, and their picture is on the toy box for the toys. Based on ONLY that appearance, what toy do you think they would select? I'm power-watching the series (again) to find clips for videos and here's what I noticed. Twilight Sparkle has been attacked by bees twice. Once in Winter Wrap Up, once in Feeling Pinkie Keen. How about you guys?